Just north of Manhattan’s Gramercy Park Historic District, two independent buildings have been united with a facade re-cladding strategy that seeks to develop a contextual relationship between two different eras. Developer HFZ Capital tapped Workshop/APD as both the design architect and architect of record for the project, which has been one of their largest to date. 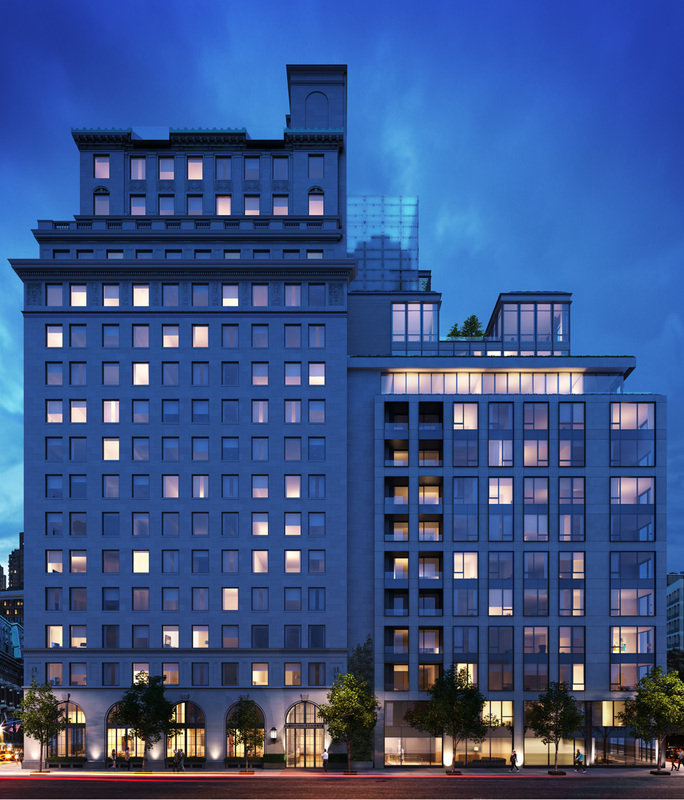 88 & 90 Lexington builds on the success of their recently completed Printing House project in the West Village. The luxury housing project involves 88 Lexington, a highly detailed pre-war limestone building, and 90 Lexington, an international style 1960’s era office building with narrow ribbon windows and thermally insufficient concrete infill panels. Both buildings were originally offices for Blue Cross Blue Shield, but have since been converted to rental units. Complexities of the project include the very large floor plates, an admittedly hideous existing international style facade, and existing rent-subsidized tenants, some of which occupied their units throughout the conversion process. Facade Manufacturer Midwest Curtainwalls, Inc. While 88 Lexington is not landmarked, the project team worked carefully and respectfully on the facade, with minimally visible interventions. Replacement windows were installed throughout the building, and a new cut in the roof allowed for extra penthouse amenities. The majority of facade work occurred on 90 Lexington, which was stripped down to the concrete framework of the structure before receiving an entirely new facade. Due to Lexington’s southbound orientation, the corner building is more prominently visible, foregrounding the pre-war 88 Lexington facade. Matt Berman, ‎Principal at Workshop/APD, told AN that their design concept was to reinforce a contextual relationship between the two buildings: "for us, it was how do you interpret this language in a modern way, so that these buildings read as ‘sister’ buildings from different time periods." To achieve this, Workshop/APD developed over 30 iterations reworking the existing facade at 90 Lexington, before scrapping a minimalist approach for something entirely transformative: a new facade attached to existing slab edge with a specialized clip detail. Thorsten Kiefer, Director of Design and Development at HFZ Capital Group, told AN that the decision to replace 90 Lexington’s facade was a significant turning point in the project: "At the very beginning it was a very big decision for us to say we were going to remove this facade, and spend extra money to get as much light into the units as possible." Clad in a nearly identical limestone material found on 88 Lexington’s facade, the new facade prioritizes a highly contextual compositional and detailing agenda. This is most apparent in the placement and trimwork on the new facade. Workshop/APD aligned new two-story rectangular openings with adjacent historic openings. Framed by a crisp metal “donut” trim, the new openings provide some continuity to ornate trimwork of pre-war building next door. Another challenge with replacing the facade was that the entire construction process had to be performed with people living in the building. Berman admits, “it would have been infinitely easier to build a new building.” Temporary exterior walls were inserted into the framework of the building while the facade was dismantled and rebuilt. Beyond the facade, Workshop/APD’s most difficult challenge was to reconcile new residential units within the large office-scaled floor plates. Berman says units didn’t cleanly stack, resulting in a Tetris-like design, and adding complexity to plumbing riser and mechanical runs through the building. Both Kiefer and Berman say the resulting quality of the layout in both buildings was one of the successes of the project. Workshop/APD was able to produce creative layout solutions that tap into an existing elevator core deep in the building, while providing generous room sizes and bonus spaces. 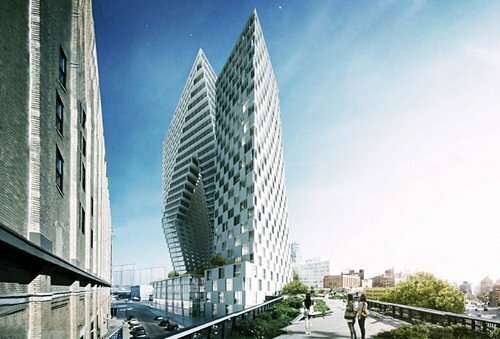 Clearly, higher ups at the Bjarke Ingels Group (BIG) are channeling beloved New York rapper Notorious B.I.G. 's approach to urban space. The firm's recent high-profile commissions (hello, Pittsburgh!) reflect Biggie's mantra: "the sky is the limit, and [you] know that you can have what you want, be what you want, have what you want, be what you want," ad infinitum. Now, Ingels is again looking skyward with a new project along New York's High Line. 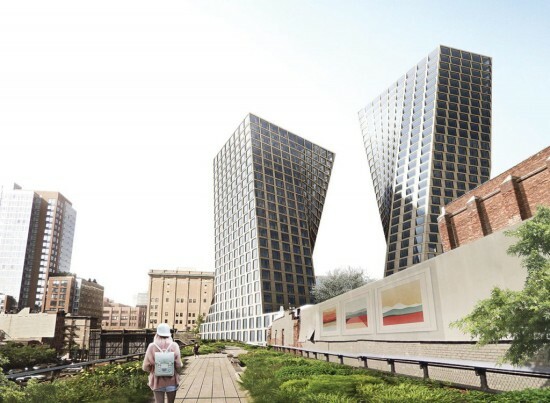 Today, YIMBY reported that BIG has released preliminary renderings for its project on the High Line, at Eleventh Avenue and 17th Street. The eastern tower will rise 28 floors (302 feet) adjacent to its 38 story (402 feet) western sibling. The buildings will feature 300 apartments (most with two and three bedrooms), retail space, and a hotel. 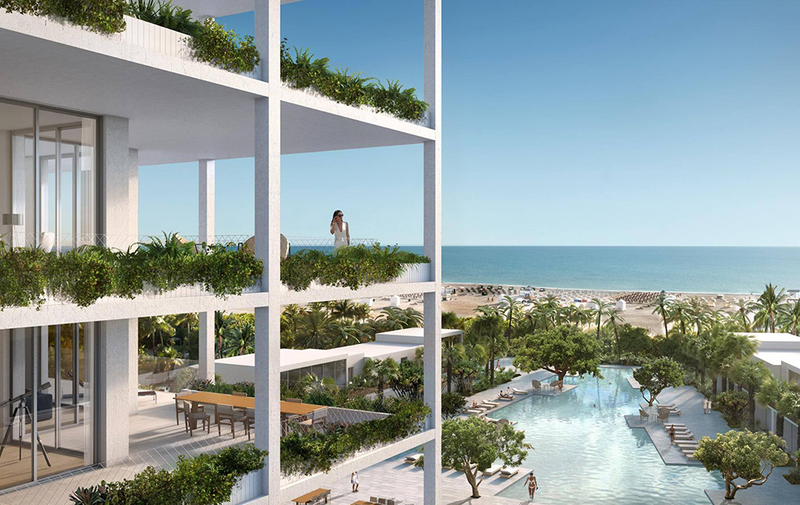 Apartments will sit above a three-level, 150,000-square-foot hotel, and 50,00 square feet of ground floor retail. HFZ Capital paid an astonishing $870 million for the site last summer. The tower's aggressive diagonal cut will allow views of the High Line from the southern side of the western tower. The project's expected completion date is 2018. Just keep pressin' on, BIG. Just as newsworthy, perhaps: Why has it taken BIG so long to land a High Line commission alongside fellow starchitects Zaha Hadid, Frank Gehry, Jean Nouvel, Norman Foster, and countless others?